For the first time in the history of Oja, the village council formed a shadow committee for women comprised of nine members. The goal was to support the newly elected town council members, two women in particular. They ran in the town’s most recent elections as part of an independent list and enjoyed considerable support from MIFTAH prior to this. 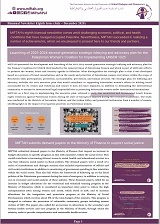 They participated in several MIFTAH-held training workshops that targeted women in the Jordan Valley, in the village of Oja in particular, which is located north of Jericho and has a population of 5,500. 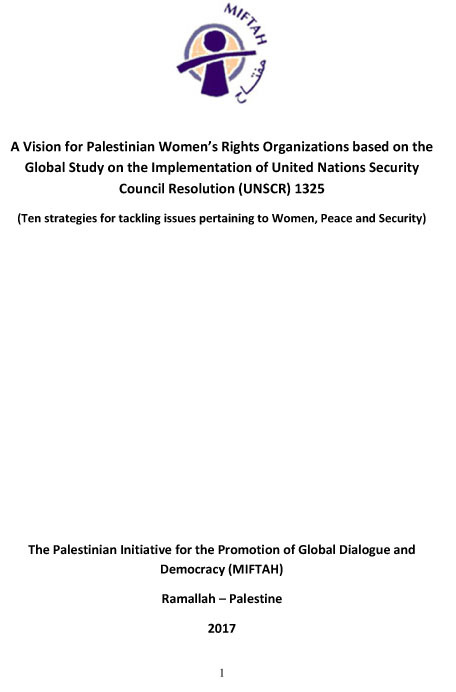 “The initiative to form this shadow council could not have materialized if it were not for MIFTAH’s tremendous support for its members and for the women of Oja in particular,” says council member Taghreed Naji. 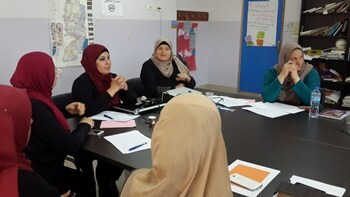 She described the shadow council as one MIFTAH’s biggest successes in the Jordan Valley, saying it was the result of many meetings and training workshops that empowered the women of the village and raised their awareness about their responsibilities and duties towards themselves and their community. In this context, Naji notes the special efforts made by MIFTAH’s coordinator in Jericho and the Jordan Valley, Najat Irmeliyeh and also the constant follow up by MIFTAH’s projects’ director, Najwa Yaghi. She said the activities motivated women to meet and form the shadow council “partly to support the town council and also to support us as women members in it.” She said they participated in every meeting on social issues and the problems and needs of the village. “The council meetings were even held in members’ homes,” Naji said. Naji, who ran in the last elections as part of the “Oja Independent List”, says her motive for running stemmed from a desire to make a change in her village, naming vital projects such as infrastructure projects, jobs for the unemployed and economic empowerment of women as a few. Naji believes her role this time around will not be marginal and that her aspirations are not only be to win a chair on the town council. That is why, since the day she was elected, she says she follows up with the priorities of the village. One priority is a sewage system. Naji joined the council committee in charge of supervising this project and closely follows up on its progress. In addition, she says she coordinates with MIFTAH on an almost daily basis, asking for advice and consultation on certain issues. Naji continues that one of her top priorities is to establish the residents’ right to the Oja water well so that they can benefit from it more than just for drinking water. She wants the residents to use the well for irrigation as well given that the village is primarily agricultural. However, because of the shortage of water today, the village is facing desertification, a challenge Naji wants to confront head-on. In this regard, she hopes MIFTAH will have a role in solving this problem through questioning the Water Authority on the subject. Naji says that because she trusts the women’s shadow committee and is confident that the women of Oja are capable and willing, she hopes MIFTAH will include the village in small projects to secure incomes for its women. This way, she maintains, they will be able to help their families and husbands financially and help alleviate the problem of unemployment. The first workshop for the shadow committee was held in the home of a candidate who was not elected, in which 15 women participated, including Naji. The workshop was about solar energy, gray water desalinization plants and artesian well inspections. Naji says the village has a constant need, which she hopes MIFTAH will respond to, which is continued support for the village’s woman in terms of intellectual and awareness empowerment. She hopes they will be included in any new meetings or training MIFTAH carries out, especially since MIFTAH’s previous interventions were an important reason why she become a town council member, citing her political empowerment and encouragement to participate in decision-making positions. Naji was a volunteer for more than 10 years and in more than one institution before she ran in local elections. “I won through the ballot box, not by acclamation,” she points out. “I was even able to win the women’s votes.” Hence, she sees how important it is for women to be represented in local councils as equal to men .”Women are half of society and the people who make the decisions at home…in the local council….and in society,” she adds. Women’s activist Um Muhanned also ran in the same list as Naji but did not win. She held the first women’s shadow committee meeting in her home. Although she failed to win a seat, she was not deterred from continuing on the path she had begun. Um Muhannad insists that she will run in the next elections until she wins with the support of the village’s other women and the shadow committee. Um Muhannad says it is particularly important for women to be represented in village councils. “Women are no longer half of society, they are two-thirds and men are the remaining third,” she maintains. Like Taghreed Naji, Um Muhannad is confident that MIFTAH will continue to support the women of Oja, who she says have drive and motivation. The women, Um Muhannad says, look to MIFTAH for support through offering more economic empowerment projects for women in addition to empowerment and awareness workshops, which are in constant demand. 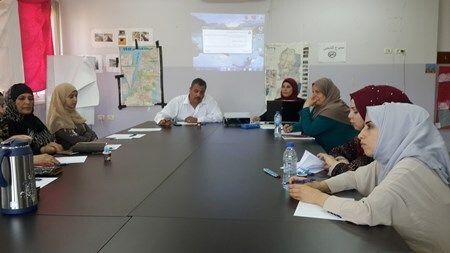 MIFTAH coordinator in Jericho, Najat Irmeliyeh cited the long list of activities carried out by MIFTAH in Oja, which is the largest village in the area. Taking into consideration customs and tradition, Irmeliyeh says she began to hold public meetings in neighborhoods in the village; women activists invited them to work from their homes. She says women were encouraged to participate in public and political life through spreading awareness about good citizenship and rights and encouraging them to participate in elections in order to create the change they want. Irmeliyeh maintained that after several of these public meetings, she felt a clear and significant change manifested in their participation in the 2017 elections as both candidates and voters. The last meeting was held at the Oja municipality on August 1 with new council members and Oja mayor Salah Freijat. The mayor spoke at length with the women about the importance of the role of women, sustainable awareness among women and help in developing the municipality in conjunction with women, confirming that there could be no development without their participation. Irmeiliyeh reaffirmed the recommendations by the women’s shadow council to MIFTAH, including: holding capacity-building training for women; conducting exchange visits with shadow councils in other districts; supporting women through projects and initiatives; and putting them in touch with donor organizations in order to promote the status and role of the village’s shadow committee.